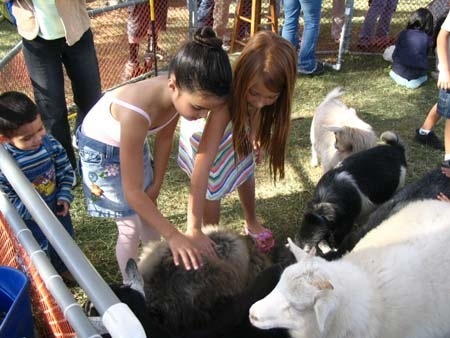 Children are always delighted with the collection of 20-30 farmyard animals in a gated 16’X30’ pen. Goats, sheep, ducks, chickens, pot-bellied pigs, and bunnies. A handler attends and cleans up. You must have a fresh water supply, adjacent, at-level parking for truck or trailer, and garbage receptacle for waste. In extremely hot weather, set up must be in shade. Pavement or grass required as gravel surfaces are unfit for the animals.